As the little lion cub notices all different types of families, he starts to question his own family. His family consists of his mother and him. The little cub learns that while there is no "daddy" in his family, there is a donor lion who made his life possible. Through his mother's love and nurturing, the lion cub understands how special he and his family are. 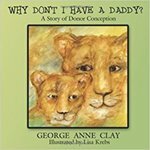 Clay, George Anne, "Why Don't I Have a Daddy? A Story of Donor Conception" (2008). DIVerse Families. 305.